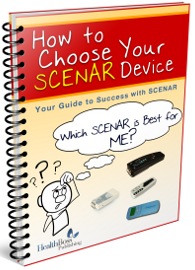 Download This FREE Report on How to Choose Your SCENAR Device! Yes, the SCENAR Can Be a Miraculous Healer... IF You Get It Right. Discover the Insider SECRETS How To Make This Technology of the Future Work For YOU! Not all SCENARs are built equal. Not any SCENAR will do what you hope it will do. It's like horses: some are born to win a race, some to carry heavy loads, and some to jump the obstacles. In order to facilitate healing miracles and use SCENAR to its full potential, you need to UNDERSTAND it - and you need to find your SCENAR match. Just enter your name and email address in the form to your right for instant access. Enter your name and email below for FREE INSTANT ACCESS to this Special Report. I need one that I can use at home. I have very bad shoulder and back pain. I also have almost daily migraines. 1) Can it help w migraines or other kinds of headaches? Hi, I’m in my mid-fifties and I have scoliosis, herniated disc, severe varicose veins, weakening fingers and swelling knuckles (due to arthritis), my knees and hips severely painful, tendinitis of feet, tarsal tunnel syndrome (feet), osteoarthritis of feet, numerous painful skin tags, severe tailors bunions which extend down below little toes. Painful inflammations bodywide, including severe ear pain and MGD (atrophied eyelid glands). ALL due to life of severe physical, social, and metaphysical stress (beyond scope of this text). Each day that I wake up, I don’t know what new horror will strike. I live all alone in terribly difficult circumstances that are beyond my control, and no relief in sight. (Home environment, weather, social, you name it.) I have tried a PEMF Mat in the past, which failed to help me. I’d lain on it steadily for several weeks. Many other devices/therapies also failed to help. All that took a significant chunk out of my assets which I could not afford. At this point I have no idea what if anything can help me. I’m afraid that soon my fingers won’t even work anymore. I had been researching a type of Infrared therapy endorsed by an M.D., and also came across info re: Scenar/Cosmodic. It’s all very mind-boggling. Due to my pain+difficult life, I’m in a state of such despair, that I wish God would grant me quick easy death, followed by oblivion. Wishful thinking. Yes, we can see that you are in a very difficult situation. When life throws us a challenge, we all need someone to turn to, a helping hand. We hope that, with your multiple problems, you find a trusted health practitioner who can lift your spirit and guide you on a healing journey. Hi, I would like to know if the scenar can help in the case of ALS – Lou gehrig disease. Thank you for your help. Yes, SCENAR and, especially, COSMODIC can help to certain extent and slow down the progression of this debilitating disorder, but, unfortunately, we haven’t yet seen it stopped or reversed. That is not to say that it cannot happen – it’s just that we do not have any reports showing that. Any degenerative disorder of the Central Nervous System is such a challenge. Ben, There are two alternative therapies for celiac disease that may help you be completely cured! the first (holistic treatment for leaky gut syndrome) is pretty modern and you’ll want to find a naturopathic dr. They use supplements, homeopathy and diet (only temporary) for you to heal. the latter NAET is a pretty revolutionary technique also holistic that actually desensitizes you of gluten.. reprogramming your brain to not see gluten as a allergen. If you believe in the prayer do so… prayer to God led me to both of these treatments! SCENAR is OK to use with ANY health disorder, Ben, but its effectiveness may vary depending on the cause of the problem. For celiac sufferers, SCENAR can definitely help in relieving some of the unpleasant symptoms and decrease abdominal discomfort yet it is not going to cure this dreadful autoimmune condition. Strict gluten-free diet is still the main thing with this disorder. The scenar device sounds too good to be true. Can it really help with someone who has emphysema? Can it not merely remove symptoms but even encourage the body to regenerate lungs? I need to know what can help. Thank you. Yes, John, the SCENAR does not only sound wonderful – it IS wonderful. It is also a well-proven in practice technology. It has been consistently surprising even experienced healers with its results for over 25 years, and it continues to evolve. Can it help regenerate lungs? Possibly. As you can imagine, there is no guarantee, as every body and every disease is different and healing depends on many factors. We had miraculous cures – and we had disappointments. The only thing is certain though: with SCENAR (or ratherCOSMODIC) you have a CHANCE, which you wouldn’t probably have any other way. Is it worth a shot? It is your call, of course, but what do you have to lose? Thank you for your helpful reply Irina. I shall look further into Cosmodic. Any true SCENAR and every COSMODIC device is going to help with speeding up healing from injuries, burns included. The only problem is, you cannot use these devices directly on a burn, because they work with the skin (or rather nerve endings in the skin), which are damaged when a serious burn is present. We use SCENAR and COSMODIC devices around the area of a burn or on symmentrical parts of the body and corresponding vertebrae (indirectly). The one technology that we would highly recommend to consider for the second degree burn though is the resonating QLaser (www.softlaser.net) – the Q1000NG+ or even the Q10. It has almost miraculous effect on burns of any nature. Can the scenar help with pudendal nerve damage following herpes simplex viral activity? Yes, Carlo, it can. SCENAR as a technology was designed to work with nervous structures. For nerve regeneration though the COSMODIC technology is better. Even the simplest COSMODIC device, such as the C-DOVE, will do the job. does scenar help cancer patients specially ovarian cancer who undergo chemotheraphy,,what type of scenar device is the best for ovarian cancer patient? if anyone knows what scenar device i can use for a person who’s has an advance ovarian cancer,,just to ease or relieve the pain that they suffer,,i will appriciate it as big help,,thank’s. Bonsoir suis infirmiere a domicile orientee dans les soins palliatifs.L objet de ma requete est de savoir si scenar est une “therapie ” pouvant soulager mes patients par un autre moyen qu un ttt allopathique qui connait ses limites. Quels sont les pro de sante ou autre qui peuvent l’effectuer? y a t il des formations?Je voudrais de + amples infos par rapport a cette technique?y a t il eu une etude concernant l efficacite de cet appareil?Comment fonctionne t il?et par quel processus intervient il dans le soulagement de la dleur sans effet secondaire? Je vous remercie de me repondre au + tot. i wish to learn more about scenars!